Can drinking beetroot juice prevent tooth decay? 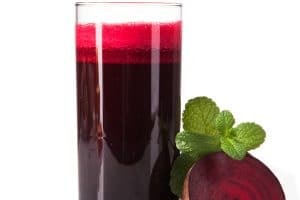 I recently read in the news that a study carried out by students from The University of Applied Sciences in Upper Austria have found that drinking beet root juice can slow the growth of tooth decay. Tooth decay is as a result of bacteria that enters a person’s mouth and makes acid, which leads to a hole in the tooth, known as a cavity. Beetroots contain high amounts of inorganic nitrates and the students found that this would be converted by the body into nitric oxide. Nitric oxide is known to slow the growth of acid producing bacteria found in plaque. The students tested 50 people, with 25 people drinking the nitrate rich juice and the other half drinking nitrate free juice. The students found that those who had consumed the nitrate rich juice had saliva containing considerably less acids than those who consumed the nitrate free juice. The drink is now being marketed under the name Bio Drachen Trank, which translates as dragon potion. The drink claims to be a delicious fruit and vegetable juice, for teeth like a dragons. – Swelling in the gums near a painful tooth. In order to prevent tooth decay, people should ensure that they brush their teeth regularly and have a healthy diet and attend the dentist. When attending the dentist people should also discuss with the dentist any problems they have experienced with their teeth or gums, since their last visit. With this recent research that has been carried out, people may also want to try beetroot juice and see whether this helps slow their caries rate. However, it is important for people to take responsibility for their own dental health and everyone knows the importance of brushing their teeth for two minutes twice a day. It is important that dentists assist patients in maintaining good oral health and those dentists provide adequate treatment to avoid the numerous problems that can follow from suffering from tooth decay. However, people also have to take responsibility in attending the dentist to ensure that these problems do no occur. If you have concerns about poor dental treatment, please feel free to contact us and we will be happy to assist.